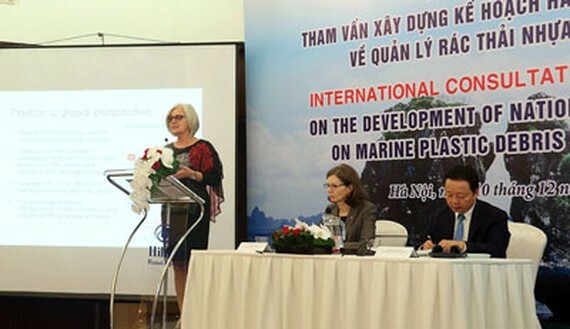 Vietnam’s Ministry of Natural Resources and Environment (MONRE) and the Embassy of Canada in Vietnam yesterday co-hosted the first consultation workshop on the development of Vietnam’s National Action Plan on Marine Plastic Debris Management in the Hilton Opera Hotel at 1 Le Thanh Tong Street in Hanoi. The workshop is part of MONRE’s consultations with key stakeholders about the challenges in managing plastic waste and discussing potential measures to effectively address plastic pollution. Experts from Canada, the Republic of Korea, and the World Bank shared international best practices such as zero plastic waste, extended producer responsibility and sustainable financing mechanisms for advanced waste management systems. The development of the National Action Plan is aligned with the country’s Resolution on the Strategy on sustainable development of Vietnam's sea-based economy towards 2030, with a vision to 2045 that defines the objectives for sea pollution management domestically and regionally. Healthy and resilient oceans are a major source of food for the world’s population, and key drivers for national economic development and mitigating the effects of climate change. As part of its G7 presidency, Canada initiated the development of the Ocean Plastics Charter, a global commitment to take action on all plastics throughout their life cycle to reduce plastic waste and marine litter. To date, 14 countries, the European Union and 20 companies have adopted the Ocean Plastics Charter. This consultation workshop represents an important joint initiative between Canada and Vietnam as they celebrate 45 years of diplomatic relations in 2018. During the workshop, an exhibition on plastic waste photos was displayed for delegates and media. “The international consultation workshop on the development of the National Action Plan on Marine Plastic Debris Management is to pursue the implementation of an initiative by Vietnam Prime Minister and concretize the Strategy for Sustainable Development of the Marine Economy of Vietnam toward 2030, with a Vision to 2045." Minister of Natural Resources and Environment Tran Hong Ha said. “Canada is proud to be taking actions with Vietnam to help develop Vietnam’s action plan on ocean plastic waste management. I am delighted to see the participation of representatives of not only government agencies, but also those of industry and civil society, including youth and women’s groups to discuss innovations and initiatives that will keep plastics in the economy and out of the oceans”. Ambassador of Canada to Vietnam Deborah Paul said. 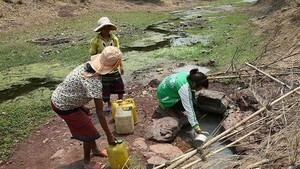 Vietnam has made solid waste management a priority. Plastic waste collecting systems and landfill management have helped to reduce plastic pollution in Vietnam. Vietnam is taking action to reduce plastic pollution via environmental protection legislation, management policies, shoreline cleanups and educational campaigns for local residents and tourists to raise public awareness of environmental protection. At the 8th Central Committee session of the Communist Party of Vietnam’s 12th Tenure, the Strategy for Sustainable Development of the Marine Economy of Vietnam toward 2030, with a Vision to 2045 was adopted. The strategy seeks to achieve the following objectives by 2030: “Prevent and considerably control and reduce ocean plastic pollution; play a pioneering role in the region with regard to minimizing marine litter; ensure 100 percent of hazardous waste and solid waste in coastal provinces and cities are collected and treated to environmental standards; ensure 100 percent of economic zones, industrial zones and coastal cities are planned and developed into sustainable, ecological and smart locations that are adaptable to climate change and sea level rise and have centralized waste water treatment facilities meeting environmental standards”. • Collect and treat 80 percent of solid waste generated in rural areas.